Do you enjoy risk? I recently heard about a couple who were at a nature preserve in Fort Myers, Florida, when they spotted an eight foot alligator. In attempting to stream a video of the beast on Facebook Live, their iPhone was dropped into the water next to the gator. Since they had photos of their toddler son on the phone, they attempted to move the phone away from the reptile with a stick to retrieve it, but this just enticed the gator to get closer to the phone. At one point, it parked its massive snout over the phone. For over an hour, the couple prodded and poked the alligator, trying to get it to move away from the phone. This just made the monster more aggressive - hissing and opening its jaws wide while waiting to strike. When the gator finally moved a few feet away from the phone, the man who had dropped it went for broke. He put his hand into the swamp water and made a quick swipe to pick up the phone. Some people have a higher tolerance for risk than other people. Risk takers typically fall into a couple of different camps. One is the person who is always coming up with new ideas and is expecting someone else to finance their golden dreams. In other words, they like to think of themselves as high risk takers, but will not put their own finances on the line. Oftentimes, these folks are incredibly reckless in business ventures because they have very little investment in the game. The second type of risk taker is the person who has put their own fortune on the line to create a business. I want to address this second type of risk taker. In my company, we deal with a lot of business owners who have taken a risk and started an enterprise. Through a lot of hard work and persistence, they have made it go.HoHow Oftentimes these folks are very cautious risk takers because they have a lot of skin in the game. One misstep and they can lose everything they have worked so hard to achieve. This cautious thinking seeps into the way they go about marketing their business. Marketing just seems like putting your hand into the gator’s mouth and hoping he won’t bite! However, when marketing is done right, it is the way you actually can put feet to the investment into your business. Here are four ways this happens. In order to be successful in any business, your market has to understand who you are and what you are selling. Awareness marketing helps you get the word out. A brand positioning statement defines how you want the marketplace to know you. This should be central to all your marketing efforts. When you are doing marketing the right way, you are measuring customer satisfaction. Marketing will help you see trends coming through customer interaction. You can zig and zag to stay relevant in your marketplace. Change is just part of business. Marketing to retain customers helps you see their changing attitudes so you can adjust your brand message to meet their needs. Competitors can eat away at your customer base. Staying ahead of your competition is key to driving customers through your doors. Measuring what your competition is doing is part of a smart marketing strategy. It is no secret that businesses that lead their industries also market themselves well against their competition. When your customers have a choice to make, you want to make sure your brand is the most attractive. Marketing helps you put your very best foot forward. A good marketing plan will help you strategically integrate your best features with your customers’ greatest needs. Marketing is not something to avoid because it is risky. When you are doing marketing right, it will help limit your risks. It all starts with a good marketing plan. What about that guy trying to get his phone back from the alligator? Was it worth the risk of losing a limb for a cell phone? As it turns out, no… and not for the reason you are thinking. 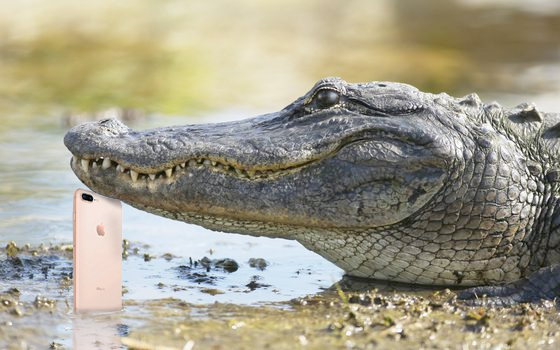 The man, Anthony Larrimore of Cape Coral, Florida, did not get bitten by the alligator and he was able to retrieve the phone. However, after an hour in swamp water, his iPhone was a goner: never to power up again.